Ogham is the first known form of writing in Ireland and it is thousands of years old. Although it is a very old form of communication it is very modern looking too as it is made up of lines running at different angles. It is unusual in the way that it is read from the bottom up and some letters are omitted from the Ogham Alphabet. We make Ogham rings with any gemstone and Ogham pendants with different items engraved on them like a Shamrock or a Trinity knot or maybe you would like an infinity design on yours? Ogham earrings can look dazzling going out for an evening as too can the Ogham pendant if it is with or without a gemstone. 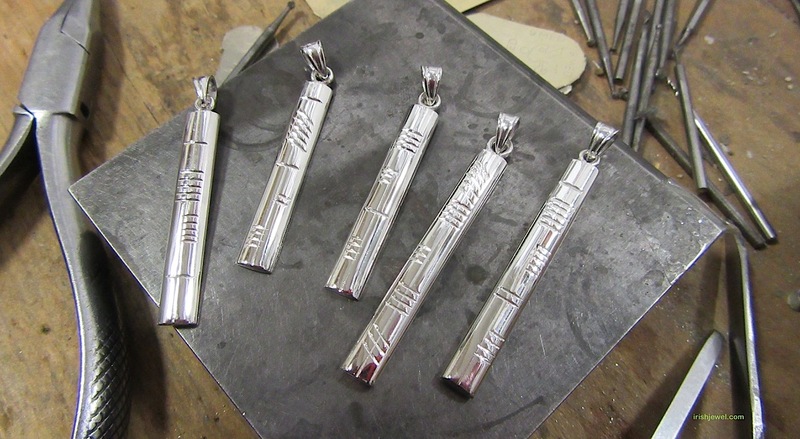 All Ogham jewelry is hand engraved either before the piece is made or after it is made. The hand engraving takes a long time to do and to get correct in such a small space. It is very difficult to put a precise year on Ogham, but it seems to retrace its steps back to the fifth and sixth century, although it may also have been established during the Roman Empire. Ogham was never a single fixed classification, as most of the surviving stones display adjustments as new symbols were invented and older symbols were lost. A few types of stones show some strong Christian influences bearing carved crosses and the primitive Irish work Koi, which is thought to be a version of the Christian Latin burial formula known as "hiciacit" or "here lies". Ogham inscriptions and engravings can be seen in the British Isles, and mostly in areas of post-Roman Irish Colonisation in locations such as Wales, Cornwall, Scotland and the Isle of Man. In Killaloe, Co. Clare there is an Ogham stone that dates to circa 1,100 and is known to be dedicated to a Scandinavian colonist named Targrim. It was originally in scripted in Norse runes and then was replicated in Ogham, which also shows a very strong Celtic influence in Ogham writings.